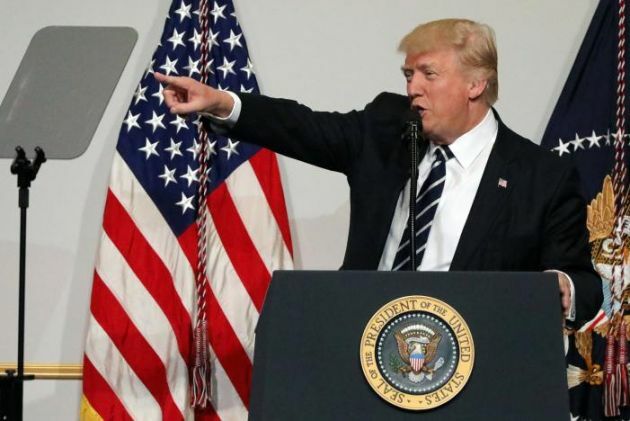 (REUTERS/Carlos Barria)U.S. President Donald Trump is one of the powerful U.S. politicians associated with the INC Christian movement. Mexico's Roman Catholic bishops have said that companies in their country expressing interest in working on a border wall in the United States proposed by U.S. President Donald Trump, are betraying their country. Some Mexican companies have considered making profits from the multi-billion dollar project and the church called them "immoral," The Daily Telegraph reported March 27. An editorial in Desde la fe, the Mexican archdiocese's weekly publication, was titled "Treason against the Homeland" and castigated Trump as a "fanatic." During a meeting with steel companies in Mexico last week, Mexico's Economy Secretary Ildefonso Guajardo said the government did not plan restrictions on businesses, The Associated Press reported. He warned that Mexicans would judge and base future buying decisions on "which brands are loyal to the national identity, and which are not." "Any company intending to invest in the wall of the fanatic Trump would be immoral, but above all, its shareholders and owners should be considered traitors to the homeland," said the bishops' editorial. The Desde la fe editorial was published online arguing that the barrier would only feed prejudice and discrimination. "In practice, signing up for a project that is a serious affront to dignity is shooting yourself in the foot," said the editorial. Mexican cement maker Cemex has said it is open to providing quotes to supply raw materials for the wall but will not take part in the bidding process to build it, Reuter's news agency reported. Another company specializing construction materials Grupo Cementos de Chihuahua, has also signaled readiness to work on the project. Mexico's Economy Minister Ildefonso Guajardo had on March 21 in a meeting with steel companies warned firms it would not be in their "interests" to participate in the wall. Guajardo said the government did not plan restrictions on businesses, but warned that Mexicans would judge and base future buying decisions on "which brands are loyal to the national identity, and which are not." The editorial, however, accused the government of responding "tepidly" to those eyeing the project for business.